For this episode we look at adding multimedia but give the users some control over the playing of that media rather than just have it play on page load. 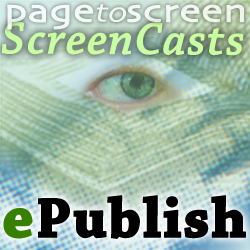 In this screencast we look at building the fixed-layout eBook (ePub3) and getting objects to appear on the screen with some animation. We also look at creating a button to make an image appear on the screen. In this first part of the 3 screencasts we look at the basic issues when creating a Fixed-layout ePub3 from an InDesign book that is already set up for print. What happens to our double page spreads? What shall we do with the half-title page? How can we deliver a fixed landscape view?